I know it has been quieter than usual around here, and there’s a good reason for that: I’ve been coding like a madman on FeedDemon 2.5. FeedDemon 2.5 – which will be free to all existing FeedDemon customers – has actually been in beta for several weeks, but I haven’t mentioned it here yet in order to keep the number of testers small. Today saw the release of FeedDemon 2.5 Beta 4, so I figure it’s time to let it loose. If you’d like to give the beta a spin, stop by the FeedDemon Beta Site to get it. Note: Although I try to make my beta versions as solid as possible, they inevitably contain a few bugs. If you’re not comfortable using unfinished software, please wait until the final release before downloading FeedDemon 2.5.
mmmmmhhh…I really love Feeddemon, but I am migrating into Ubuntu Linux…Are You planning to make Feeddemon fully compatible with Linux ??? Please answer YES !!! AAAAggggghhhhh !!!!! I cant live without FeedDemon !! it might work under WINE though. I have successfully run FeedDemon versions as recent as 2.1 to run on the Dapper Drake release of Ubuntu under Wine. The only thing that doesn’t work is the tray icon, but that’s not a big deal. Delphi for Linux is called Kylix. The big issue would be FeedDemon’s reliance on IE, though. Still, as long as it works with Wine, you’re good. Nick, the style redesign with “Mark page read” alone is enough for me to upgrade. Thanks. Looking forward to all the other little things. Are you going to support the image thumbnail view also for feed synchronized with newsgator? Simone, the media RSS thumbnail view should already work with synched feeds. If you’re seeing otherwise, please stop by our support forums at http://www.newsgator.com/forum/ and let us know the URL of a feed that should be showing thumbnails. So, basically, thanks. :-) Apart from one small feature I’d like to get added, FD is pretty much the perfect reader, I think. TopStyle is dead!, long live to TopStyle!. Well Nick, I’ve been a FeedDemon user from day one. 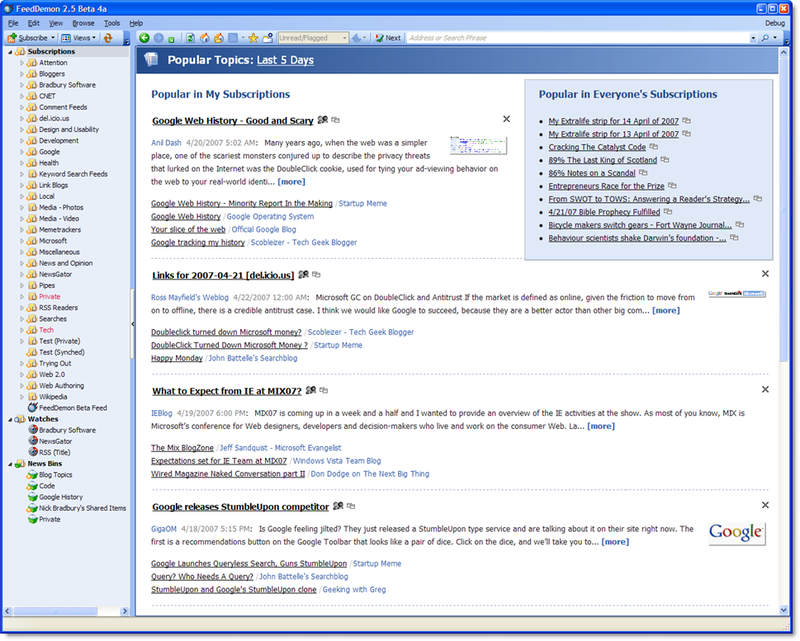 About a year ago I switched to Google Reader, which works just perfect for my needs. Now and then I check out your latest betas. But I can’t get used to Newsgator. It just doesn’t feel right. So, from the moment FeedDemon allows synching with Google Reader (Google Reader API should be on it’s way) I’ll be back and I’ll refresh my subscription. But for now: you lost me. I’m sorry about that. Paul, glad to hear you like the new beta. You’re right that it takes longer to build the popular topics – but this only happens the first time you use this feature, so I hope it doesn’t detract too much from it. BTW, I’m working on speeding things up when you click a folder. Just tried popular topics again and it’s lightning fast, so that’s great. Nice work, whatever you changed! The only thing ‘missing’ now – Akregator has a dedicated “Articles” tab (== newspaper). If you click on a feed in the left bar, it takes you to the articles tab, rather than overwriting whatever you’re reading right now. I quite like this behaviour. Is this something you’d be willing to add to FeedDemon, or do you think it would cause too much confusion? A post in the support forums would be great – that way, other customers are more likely to see it. To answer your first question, though: I use AQtime for profiling. Check http://nick.typepad.com/blog/2006/06/aqtime_case_stu.html for a few details.